2017 brought the most violent incident in TriMet history, and as Transit Police Commander Sara Westbrook releases the annual security report analyzing reported crime on the transit system, the May 26 attack had a defining impact on the year. 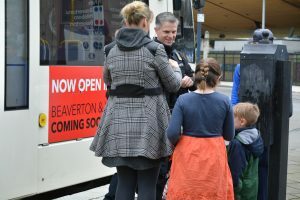 It increased awareness and led to a large increase in security presence – an effort that TriMet continues to ramp up in 2018. The compiled crime statistics are based on the National Incident-Based Reporting System (NIBRS). It tracks and counts all offenses within a single reported criminal event, rather than the individual incidents. Therefore, the statistics should not be confused with single incidents and cannot be compared to statistics prior to 2016, which compiled the most severe offense within an incident rather than all offenses within an incident as NIBRS does. The statistics capture all reported offenses, whether proven to be valid, prosecuted or dropped for any reason including due to lack of evidence. The statistics regarding offenses on and near the TriMet system recorded 1,424 reported offenses against person, property or society among the more than 97 million trips TriMet provided in 2017. In 2016, 1,247 such offenses were reported. 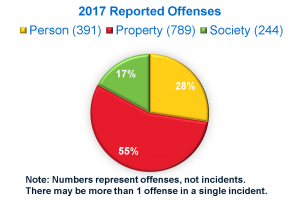 Most of the reported offenses in 2017 – 789 – were crimes against property. While the statistics do not indicate individual incidents, they do indicate the level of reported crime on the system increased in 2017. The May 26 attack on a train pulling into Hollywood Transit Center led to 15 of the reported offenses. Of the more than 1,400 reported offenses, 922 or 65 percent were against TriMet customers. Just over 13 percent of the reported offenses, or 191, were against security guards, law enforcement and victims not defined as TriMet customers. Reported offenses against employees registered nearly 5 percent of the total, or 67 offenses. While the number of reported offenses is low when compared to the number of rides provided in 2017 – a single offense for every 68,000+ trips – TriMet has increased the level of security on the system with a balance approach of Transit Police, unarmed security personnel and TriMet staff. 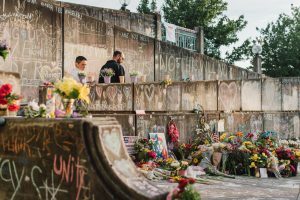 Immediately following the May 26 attack, TriMet partnered with Transit Police and other law enforcement agencies to provide overtime for added patrols on the system. 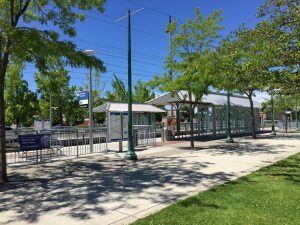 Extra patrols were added around the major events such as the Rose Festival and during holiday times, in addition to the routine patrols and presence Transit Police provide on the transit system. TriMet increased the presence of contracted G4S security personnel, increasing the number on the system to 37 by the end of 2017. These security officers do not carry guns. They patrol the system and immediately report serious concerns for police and emergency responders to be dispatched. TriMet also contracts with the City of Portland for street-level outreach workers to provide additional eyes and ears on the system. They use de-escalation strategies to diffuse possible conflicts, especially with youth. In addition to the added security presence, TriMet field supervisors maximized their time on the system. On-street Customer Service staff and TriMet operators also provided uniformed-presence while providing assistance and assurance to riders. TriMet continues to increase security presence and efforts in 2018. We have increased the hours for our G4S security presence from 2800 hours a week spent patrolling the system at the beginning of the year to 3200 hours as of May 2, 2018. TriMet plans to increase the Safety & Security Division budget in Fiscal Year 2019, which starts July 1, 2018, by $3.5 million or more than 13 percent to an overall level of more than $30.2 million. Those funds will add more coverage by G4S officers bringing them to a level of about 3,600 hours a week. TriMet is working to increase the number of Transit Police officers as well, adding 7 positions to bring the Transit Police staffing level to 75. Police officer shortages nationwide have been challenging but TriMet continues to work with local law enforcement agencies to fully staff those positions. In addition to TriMet’s Transit Police and G4S security personnel, TriMet will be adding a new type of officer that will provide security and conduct code enforcement while assisting customers. We are finalizing a contract with Portland Patrol Inc. to bring on these new positions. They will have specialized peace officer backgrounds in law enforcement or security roles as defined under ORS 133.005. They will receive TriMet specific training as well as training in de-escalation techniques and dealing with individuals experiencing mental health issues. We expect to have about 30 of these officers patrolling the system within a year’s time. We continue to upgrade the quality and coverage of TriMet’s closed-circuit television system. There are more than 6,400 cameras throughout the TriMet system – on board our buses and trains, and at our platforms, transit centers and Park & Rides. TriMet is adding cameras for more coverage, upgrading analog ones to digital for better quality and converting on board cameras to allow live monitoring. Station renovations provide increased safety with an approach referred to as “crime prevention through environment design.” In 2017, Gresham City Hall Station was redone, and early this year, the E 122nd Ave Station was renovated with work now underway at the E 162nd Ave Station. These projects increase line of sight so users can see and be seen, reduce hidden areas, upgrade security cameras with better fields of vision and improve lighting. TriMet is developing a system in which riders will be able to text non-life threatening security concerns. For serious issues, riders still will be directed to contact the operator or call 9-1-1 or text 9-1-1 if they are unable to make a voice call. We hope to launch the new security text system in summer 2018. Personal safety education aimed at encouraging riders to be aware of their surroundings and to keep their belongings in their possession will continue. TriMet is forming a Safety & Security Advisory Committee, a subgroup of our Transit Equity Advisory Committee, which will meet for the first time in June. Riders are already seeing one of the efforts that will provide added safety for our bus operators – safety panels around the operator’s seat. The enclosures are adjustable, allowing the operator to keep the window of the panel open, partially closed or closed. While the vast majority of our riders treat operators appropriately, some riders do not and as operator assaults have become a national trend, use of such barriers or safety panels is becoming common. TriMet will include the panels on all new buses purchased. All existing buses will be retrofitted with the panels as well in the coming years. TriMet will continue to push for legislative changes that would make assaults of transit workers a felony, as are attacks on police officers. This requires a change to Oregon Statute. TriMet and the Amalgamated Transit Union (ATU) pushed for such legislation last year, but we were not successful. Our Security Continuous Improvement Team continues to work on other initiatives to increase the safety of operators and employees with enhanced assault awareness and prevention training, redesigning standard operating procedures and improved counseling and support following incidents. 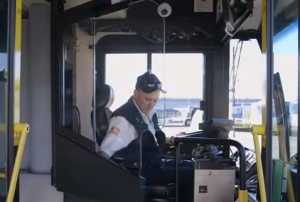 The team is made up of bus operators, Security Division managers, Transit Police personnel and other TriMet staff. TriMet is not alone in experiencing an increase in reported crime in 2017 from 2016. The City of Portland – the largest city in TriMet’s service district – also saw offenses go up last year. TriMet had a sharper increase in reported offenses at 14.7 percent than the city did at 7.45 percent. However, the low numbers of reported offenses on or near the transit system (1,424 total) versus the City of Portland (56,894 total) prevent direct comparison. The overall trend of increasing reported offenses, with most being property crimes, do correlate. Half of TriMet’s reported offenses were on the rail system, which includes both the MAX Light Rail and WES Commuter Rail systems, and the other half on the bus system and at other locations such as Park & Rides, rail rights of way and TriMet’s office buildings. 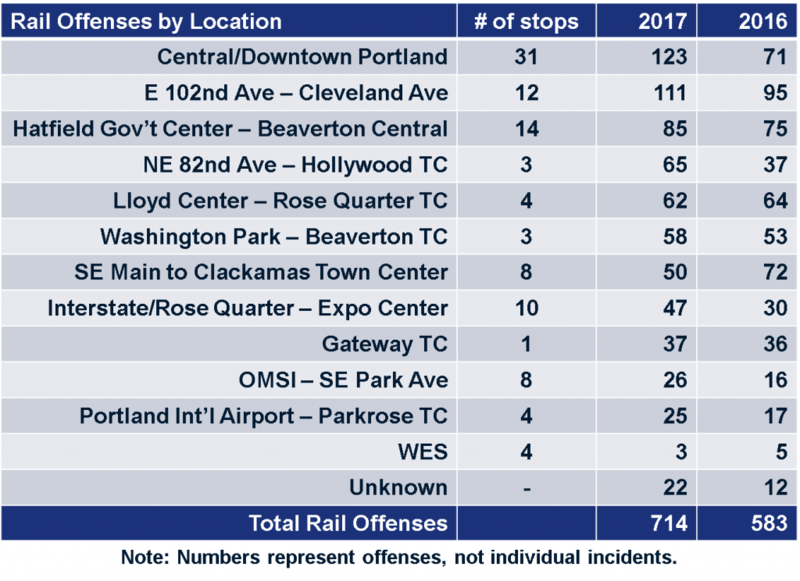 On the rail system, the Central/Downtown Portland area has the most number of stops at 31 and saw the highest number of reported offenses at 123. Offenses should not be confused with incidents as there may be multiple incidents in a single incident. Reported person offenses against customers show more than 60 percent fall into the NIBRS definition of simple assault. Reported simple assault offenses came in at 168, followed by aggravated assault offenses at 63 and intimidation offenses at 44. Three of the aggravated assault offenses reported capture the two deaths and critical injury to a third man during the May 26 attack. 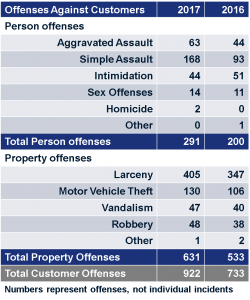 The largest crime against customers involved their property with 631 reported offenses. The largest reported property offence was larceny at 405, which includes items believed lost or left behind that were not turned into TriMet’s Lost & Found. Reported motor vehicle thefts were the second highest crime against customers’ property at 130. 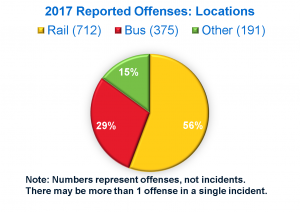 TriMet employees reported 67 offenses in 2017, an increase of 12 offenses from 2016. 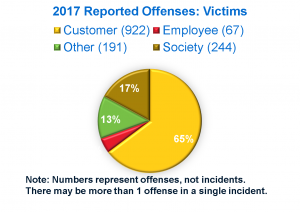 Note that the overall offenses do not indicate individual incidents as there may be more than one reported offense in a single incident such as an assault that also involved theft of property. Most of the crimes against employees were person offenses at 55. Bus operators reported most of the person offenses at 38. That’s up six offenses from the prior year and among the more than 57.4 million bus trips provided in 2017. Rail operators reported five of the person offenses, up two from 2016. Reported offenses in which the society as a whole is considered the victim rather than an individual rose by five in 2017 to 244. Most of those were drug/narcotic offenses at 209. View the complete Transit Police Division annual report for 2017. View slides of the annual security report TriMet Board presentation. While the May 26 attack increased riders’ awareness, TriMet hopes that heightened level of attention continues.